Lettering I designed for tattly before leaving NYC. This day in 2012, I tearfully hugged my parents goodbye at Newark Liberty International Airport. I was leaving New York City to move to Kansas City, Missouri. Joining me were my two cats, a few suitcases, and my best friend Julie for moral support. A week later, Julie was back in New York City and I was starting my new job as a Typeface Designer at Hallmark Cards. On my first day, I remember getting blank stares when I asked where I could get a bus pass and why I couldn’t get FontLab to open on my computer. Fast forward 5 years, I still live in Kansas City, still make fonts for Hallmark, and use Glyphs instead of FontLab. There’s so much to say about being employed as a typeface designer at one of the largest and oldest card companies in the United States. As folks in type have discovered when they ask me questions about my job, there’s a good amount of stuff I cannot talk about. What I can share is what I have personally learned over the years moving to a place I knew nothing about to do work that I love. Before starting my job, I was told by some folks in type that it was going to be cushy. They were definitely wrong about that! Hallmark is not the kind of place where you work for a year and go somewhere else. It’s a job that is going to take awhile before you truly feel comfortable in your role. Employees would be doing themselves a huge disservice if they didn’t stay for at least a few years — especially when they are working as a lettering artist or typeface designer. The people I work with are ridiculously talented, work really fast, and get so much done in an 8 hour workday (the studio I work in is a ghost town after 5:30pm). Many of my coworkers have been lettering for as long as I have been alive. One of my first creative breakthroughs happened in a watercolor workshop hosted by Craig Lueck, Amber Goodvin, and Barb Mizik. Prior to that class, I had no idea how to use watercolors and avoided using a brush to draw or letter anything. After that class, I was addicted to drawing with a brush and watercolor, and starting drawing letters in new ways! Knowing how to use different tools was helpful when I got those font projects where I was supposed to add a second set of A-z to an existing font — especially those fonts with lettering styles that were not created with a pointed pen. Year 2: Sometimes you just have to put your trust in others — even when it’s scary! One thing that cramped my style in Kansas City was not having a car. It took awhile (18 months to be exact) before I had the money and felt comfortable investing in a metal box with wheels. Unlike North Jersey and New York City, the bus didn’t always go where I needed to go. Renting a car or taking a cab every time I wanted to go from point A to point B was not an option. There were many moments I had to start trusting new friends — especially when they would offer me rides. A lot of this anxiety seeped into my work. There were moments at my job where I disagreed with the work process. The way I was taught at Type@Cooper was not always how things were done at Hallmark. Learning how to pick and choose what projects and processes I wanted to focus on was challenging. How do they feel about me turning their work into software that could be used by any designer or creative at the company? What if it doesn’t look like their work anymore? What if they hate it and never want to work with me again?! It was a really amazing moment when I discovered that the philosophy of so many folks I work with is that everyone’s lettering/illustration style is unique. To them, being inspired by another artist is just going to create new work. 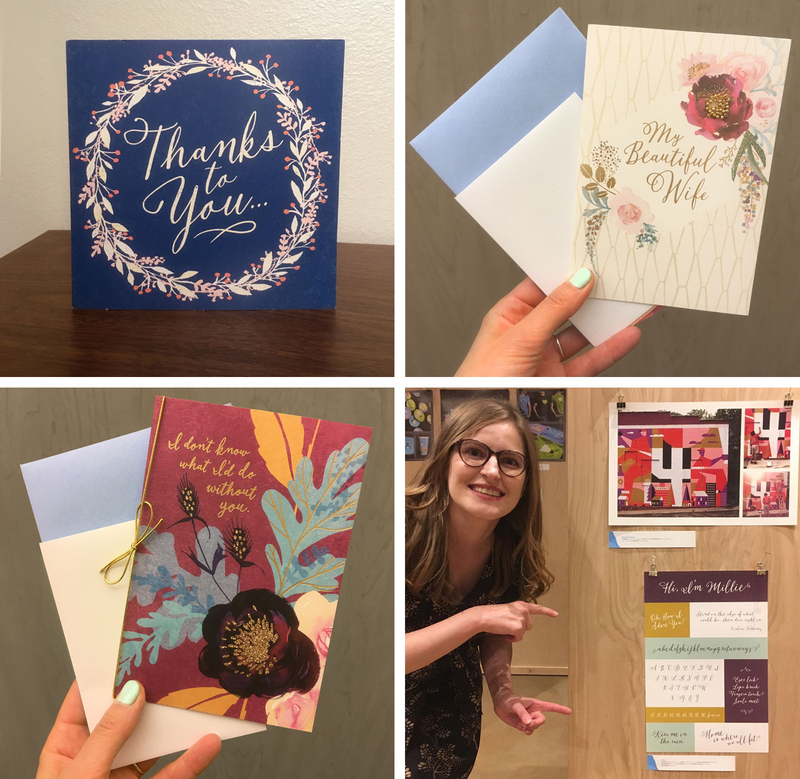 A few examples of fonts I designed in collaboration with Hallmark Lettering Artists (from Left to Right): Barb Mizik, Amber Goodvin, Livy Long (connected script font). A lot of artists also loved having their lettering turned into a font so they don’t have to letter in the same style over and over. Many use fonts as a starting point to make something more custom. I know many of you have been asking the question, “did you get burned at all in the process of putting your trust in others?” In my day-to-day at work: absolutely not! Year 3: Embrace what you can control and what you can’t. That year, a lot of changes happened personally and professionally that were completely out of my control. After years of having random foot pain, a doctor finally figured out what was wrong. I had to get surgery on both feet to repair cartilage loss in my toes. Later that year, I got really sick. Months later, I found out I had Crohn’s Disease. Right smack in the middle of all of that, there was restructuring going on at work and several people on my team were retiring, including the person who hired me. It was so challenging to stay calm when everything around me was the opposite. I started to ask myself, “What are some things I can control?”. I started small by ending my nail biting habit and proceeded to work on other things I had control over. Knowing that there are some things you can control can be incredibly comforting during moments when there’s a lot of uncertainty. Year 4: It takes time to get good. For the past few years working at Hallmark, there had been many moments where I simply wasn’t proud of the work I was doing. My work was always progressing and people were happy with it, but my ego was getting the best of me. It was hard not seeing my fonts in use when I was seeing stuff my coworkers created on things. Then 2016 happened and I got a bunch of really great projects. Custom font for Hallmark blog Think.Make.Share based off of the lettering of Master Artist Lynn Giunta. First, I worked on a custom font for Hallmark’s blog think.make.share. Then I got to collaborate with a lot of really great lettering artists on numerous font projects. I also pushed myself completely out of my comfort zone with a font called Millie that ended up winning an award through AIGAKC for excellence in type design. Some of my favorite uses of Millie HMK, a font I made for Hallmark Cards. In the meantime, I connected with several Alphabettes and talked to them about my doubts. When they started to tell me that it took some time before they started seeing their work in the world, I stopped questioning my abilities. One random day, I started to see work I did when I first started on cards, in project rooms, on products in stores. It was then that I realized that my job as an in-house type designer is not about putting my point of view out there. It’s making tools for the creatives designing these products. A few of my fonts in the wild. It was then I started to ask designers what they needed, liked, and slowly started getting feedback. Year 5: You will grow the most by allowing yourself to be uncomfortable. At the end of year 4, I’d made a ton of great work but also got some feedback in the beginning of the year that made me realize there were things I needed to work on in order to keep moving forward. Although I found the feedback helpful, it was also upsetting. I was feeling like I did when I first started: uncertain, uncomfortable, frustrated, and discouraged. I asked the creative director in our studio for some guidance and recommendations for a mentor. She introduced me to a brilliant woman who is a director from another department and is known by her peers as a “fixer”. I have learned so much from her this year, about being a better communicator and what I can do in my day-to-day to be a more productive employee. My creative director also gave me an exercise to figure out my strengths as an employee and how I would like to move forward in my career. There was one strength that I discovered I had: I’m a connector. It was then that I decided to work on applying that attribute to my career development. I began the year by joining a planning committee. I got on the steering committee for Kansas City Design Week and helped them plan and run events. Months later, I was asked to join the AIGAKC board to help with external events. I started writing down every accomplishment and positive feedback I’d gotten (even when I didn’t believe it or doubted the source) and realized I do so much! I also discovered that it’s great reference material for writing the tedious and annoying annual review! I helped my coworker host a type design workshop where we taught coworkers how to make fonts in 2 days. Before that day, I felt very uncomfortable in a teaching environment. Helping his workshop be successful made me realize I’m a better teacher than I realized. I decided to start sharing my experiences working as a type designer. I spoke in front of 30 people in June at typelabs, and in the fall, spoke in front of 200 of my coworkers about how a frustrating font project became amazing when I embraced being uncomfortable. I made several coworkers and managers cry “inspired tears” during my talk. Step by step, I faced my weaknesses and started the process of defeating them. It has not been easy, but I know it’s made me a better employee and a better person. December 2017: I cannot believe I’ve been at my job 5 years! A few weeks ago, my coworkers celebrated my 5th anniversary at work with a small gathering. I was surprised with a funfetti cake, words of congrats, and hugs from coworkers — many who feel more like friends at this point. My coworker Barb made me an encaustic painting to commemorate this accomplishment, a number 5 that made me tear up when I saw it waiting for me on my desk. Former interns were the first ones to give hugs and words of congrats. A few coworkers left cards next to my cake. It’s moments like these that make me realize I made the right choice moving to Kansas City 5 years ago. I have been growing amongst so many wonderful people who are also here chasing their dreams. Lila works as a typeface designer for Hallmark Cards in Kansas City, Missouri. She has a BFA from SCAD and is a graduate of Type@Cooper. When she is not lettering for people or talking about type, she enjoys drawing on eggs, making sushi, visiting new places, and watching Mets baseball.